Figure 1: Two braking zones with GPS speed in black, braking G in blue, and delta brake in purple. The delta brake channel is the derivative of the braking G channel, showing how quickly the brakes are applied and how smoothly they are released. 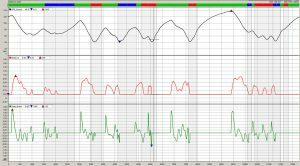 Previously we have looked at braking G – a math channel that shows only the braking portion of longitudinal acceleration – and derivative channels, which show the rate of change of a value over time. 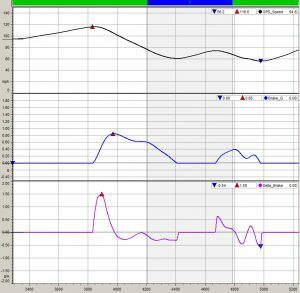 Here we will look at the rate of change of braking G, which can be used to show further detail on braking performance. This channel is simply the derivative of the braking G channel, and is referred to as delta brake. Figure 1 shows two braking zones, one from approximately 3800 feet to 4400 feet, the other from approximately 4650 feet to 5000 feet. GPS speed is shown in black, braking G in blue, and delta brake in purple. When the rider initially applies the brakes, braking g rises quickly to a peak value. Here, the delta brake channel spikes to a value that represents how quickly braking g is increasing; in this case, delta brake reaches 1.5 g/s. 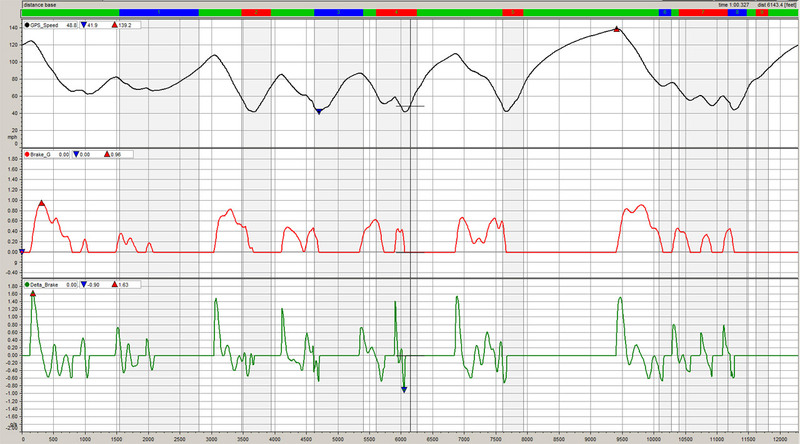 This is a measure of how quickly the rider applies the brakes at the beginning of the braking zone. Riders with moderate experience will typically show values of 1.0 g/s and higher, while expert-level racers can show upwards of 3.0 g/s in some cases. In a typical braking zone, braking g remains close to maximum while the bike is upright, and then tapers off gradually as the rider banks into the turn. Ideally, the brakes will be released smoothly and steadily, with a constant decrease in braking G. In terms of the delta brake channel, this will ideally show as a small negative value through the braking zone following the spike of the initial brake application. In the first braking zone shown in figure 1, delta brake is between -.25 g/s and zero following the initial spike, indicating a fairly smooth release of the brake. In the second braking zone shown here, however, delta brake goes to -.5 g/s and back to .25 g/s, indicating the rider is actually re-applying the brakes after beginning to release them midway through the braking zone. Figure 2: A lap of Spring Mountain Motorsports Ranch, with GPS speed in black, braking G in red and delta brake in green. Figure 2 shows an entire lap of Spring Mountain Motorsports Ranch, with GPS speed in black, braking G in red and delta brake in green. Here, the delta brake channel shows spikes reaching 1.5 g/s in many of the braking zones, indicating a good initial application of the brakes, but through the remainder of the braking zones the delta brake trace is very sporadic; some attention is needed in this area. Note that while the initial application of the brake is largely dependent on the rider’s skill, it is limited by the speed at which the front suspension collapses as the load is transferred to the front wheel. If the brakes are applied too quickly and too much load transfers before the suspension is compressed, front tire traction can be lost. Smoothness in the release of the brake can be due to many factors, some related to the rider and some to setup or even maintenance. The rider may be braking early for the turn, and releasing and re-applying the brakes once he realizes this; or it may simply be a matter of having the rider pay attention to this aspect and make a conscious effort to be smooth releasing the brake. On the mechanical side, factors could include lack of compliance in the front fork leading to inconsistent braking action over bumps, inconsistent or too much engine braking affecting corner entry, or the braking system itself may need attention.